Evolution (Biology) - Study and teaching - Activity programs. Naturalists - England - Biography - Juvenile literature. Darwin and Evolution for Kids traces the transformation of a privileged and somewhat scatterbrained youth into the great thinker who proposed the revolutionary theory of evolution. Through 21 hands-on activities, young scientists learn about Darwin's life and work and assess current evidence of evolution. Activities include going on a botanical treasure hunt, keeping field notes as a backyard naturalist, and tying knots for ship sails like those on the HMS Beagle. Children also learn how fossils are created, trace genetic traits through their family trees, and discover if acquired traits are passed along to future generations. By encouraging children, parents, and teachers to define the differences between theories and beliefs, facts and opinions, Darwin and Evolution for Kids does not shy away from a theory that continues to spark heated public debate more than a century after it was first proposed. About Kristan Lawson (Author) : Kristan Lawson is a published author of children's books. 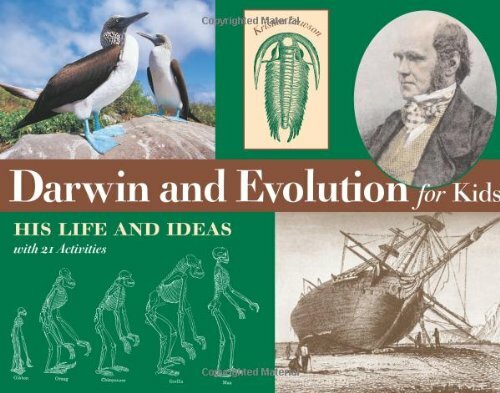 Published credits of Kristan Lawson include Darwin and Evolution for Kids: His Life and Ideas with 21 Activities (For Kids series).